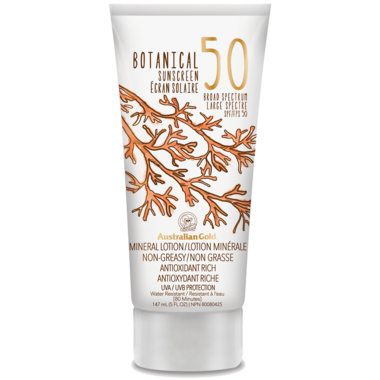 The Australian Gold Botanical SPF 50 Mineral Lotion is more than just powerful sun protection – it’s gentle care for your skin. This non-chemical sunscreen lotion delivers non-whitening protection with a refreshingly luxurious, powdery-clean feel. Rich in vitamins and antioxidants from native Australian botanical ingredients, it allows you to enjoy the sun your way, protected from both UVA and UVB rays, and water resistant for up to 80 minutes. Easy to apply and doesn't leave your face white, even when reapplying. This is one of the best sunscreen's I've ever used. It also smells AMAZING. I've very thankful that Australian Gold came up with a natural option. It's perfect for anyone who breaks out from chemical based sunscreens. This is my first time using mineral sunscreen. The scent is lovely. It goes on easily and is does not leave all that white behind. I have used NUMEROUS mineral sunscreens, and this is the best by far. Rubs on really well, and doesn't leave you all white. And it smells lovely. I bought 4 tubes, including the tinted one for my face. Love it as well. I recommend this one to all my friends. Best Mineral sunscreen yet! !